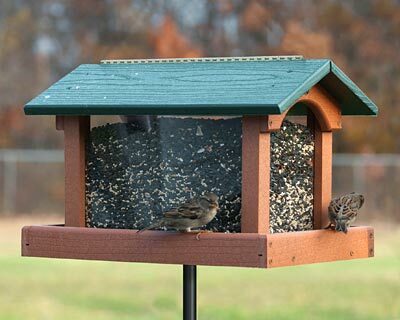 Feed an entire flock of birds at once from the Woodlink Recycled Plastic Premier Hopper Bird Feeder. This generous and environmentally sound feeder is loaded with features birds love. The large reservoir holds 8.8 quarts of seed, and offers feeding room on each side. The extended sides and raised lip on the platform enable several birds to perch at once. A green, powder coated screen base allows water to escape the seed, keeping it dry, and a large baffle in the bottom of the reservoir prevents a dirty residue from forming. The four plastic panels keep seed levels visible, and the significant roof protects the unit from rain. The feeder is made from 90% recycled plastic, minimizing the plastic in landfills, and the hinged roof enables quick cleaning and refilling. This sturdy construction does not absorb any moisture, and thus will not harbor bacteria or mold, and also will not crack, peel, or rot. Use a mounting bracket (not included) to pole or post mount this feeder. Offer several birds a feeding station in your yard with this Recycled Plastic Premier Hopper Bird Feeder. Made in the USA. Capacity: 8.8 qts., 13.2 lbs.